Successfully Added FlashMax G179 - Waterproof CREE LED Flashlight to your Shopping Cart. Introducing the FlashMax G179 waterproof, high performance LED Flashlight. This torchlight is something to truly get excited about. It's extremely powerful. Exceptionally durable. Waterproof. And uses Cree LED's, so you know you will get bright white light with years of service from this thoughtfully designed Flashmax LED Flashlight. Powerful: The secret behind this amazing flashlight torch - it use LED emitters manufactured by CREE, the industry leader in flashlight components. The benefit to you: high intensity beams you can always rely on whenever the need arises. More importantly - LED lamps shine brighter and use less energy than standard halogen lights. 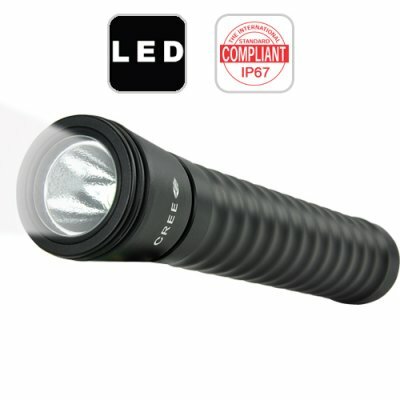 Durable: This Cree LED Flashlight employs a precision machined dura-strength aluminum alloy case that has been anodized for extra corrosion resistance. The benefit to you: a high performance device that easily withstands industrial use wear and tear like no other. And here is the best part, this LED Flashlight is waterproof down to 20 meters, meaning you never need to worry about the weather or environmental factors when you strap the Flashmax G179 onto your belt. Bright: Using the Cree Q5 LED with a spun and polished reflector, this flashlight has just about the brightest center beam candlepower you can get from an LED Flashlight powered by standard AA batteries. If you thought you could not get bright white light from a AA battery powered flashlight, then prepare to be amazed by the Flashmax G179. And since it is powered by AA batteries, you can quickly and easily change batteries when the need arises. The CVNY-G179 is perfect for police officers, security professionals, military personnel, home use, business use, keeping in vehicles, and especially reselling online! This incredible tool comes with Chinavasion's famous 12 month warranty and is the perfect gift for yourself, your loved one, or better still as a resale item because of its high margin potential. FlashMax LED Flashlights - add them to your online catalog and watch your sales grow! Waterproof and IP rated for any environment! Are these like MagLite flashlights? Eu adiquiri essa lanterna há algum tempo! Muito boa pra mergulho, com ela eu mergulho mais de 7 metros e ela aguenta numa boa!! Também é resistente, caiu varias vezes e continua uma beleza! !